Two cards, again, today. The cards are for two Our Daily Bread Designs challenges: ODBDSLC27 and SNTODBD19 and for the current Waltzingmouse sketch challenge, WMS#12. 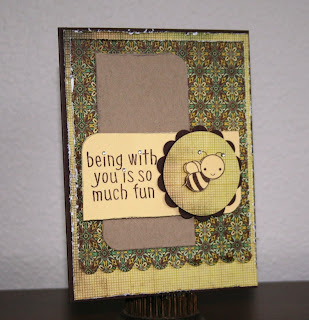 First up is my card for ODBDSLC27 and a challenge to use texture. 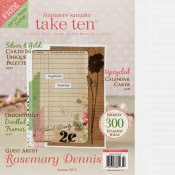 I had just recently gotten a new embossing folder from Stampin Up! called Elegant Lines and I dearly wanted to use it. I cut a piece of My Minds Eye patterned paper (it is from one of their now retired lines, but not sure which one) to fit the card front, placed it in the folder and ran it through my Cuttlebug. Then I did a bit of distressing with a distressing tool and added some Ranger Distress ink - Tea Dye. I die cut the Vintage Cream & SU! 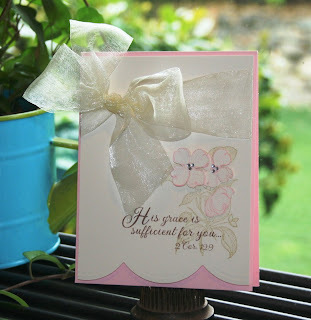 Blush Blossom cardstock using a Spellbinder Labels 4 die, distressing each with some Tea Dye ink. 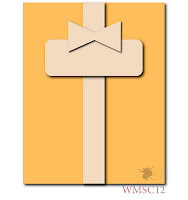 The cross from the ODBD set Cross of Christ was stamped in Ranger Distress Ink Tattered Rose and then the sentiment from Lift Up Our Hands in Memento Rich Cocoa. Some cream silk ribbon and a few pearls finished the card. 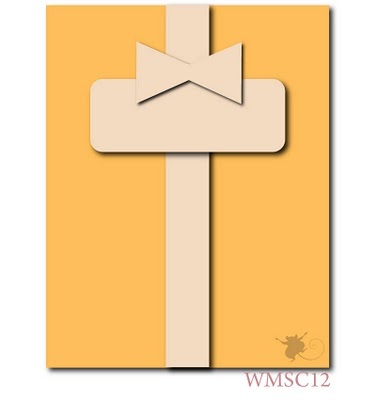 The second card is for SNTODBD19 and uses WMS#12 for the layout. 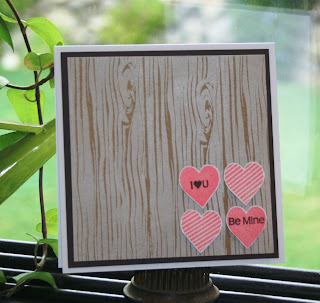 This time I used another new embossing folder from Sizzix. This one is from the set called "Hello Friend". I have seen numerous beautiful cards made using this folder and finally got my hands on one. 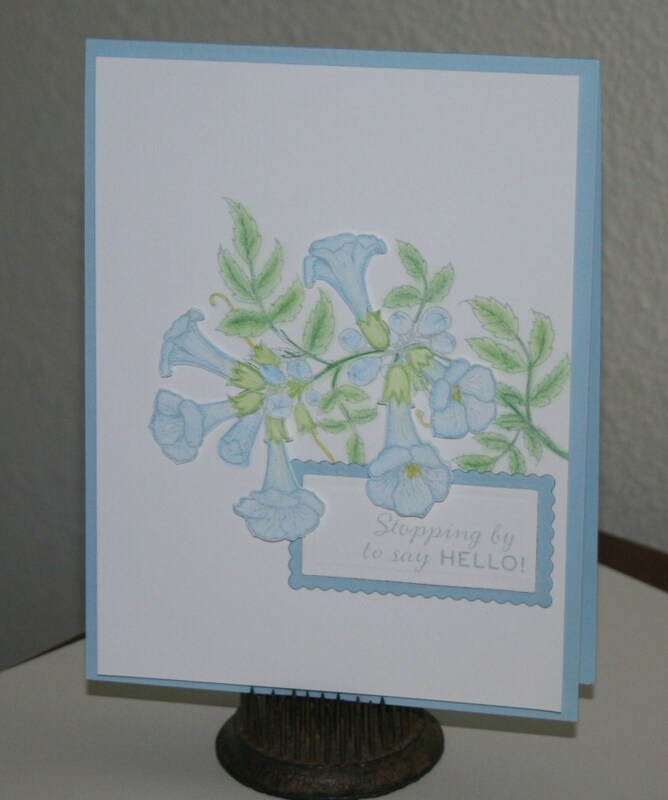 After embossing the Spring Rain cardstock I added small light blue rhinestones to the card. 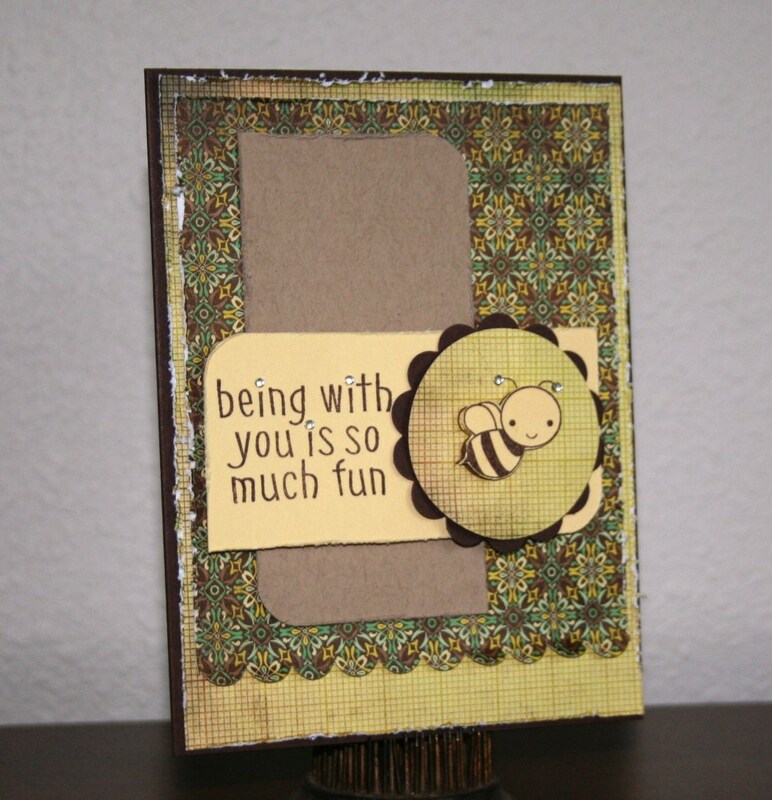 I die cut the label using my Cuttlebug & Spellbinders Labels 10 die. 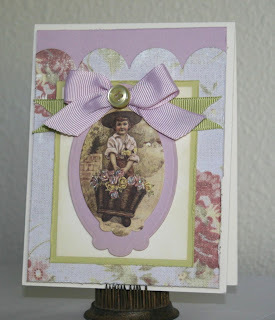 The frame is from the Waltzingmouse Stamp set Very Vintage Labels 10. The sentiment is from the ODBD set Don't Worry. Rounding it all out is the little bird from the Hero Arts cling set Two Birds, as part of the challenge for SNTODBD19 was to have a bird on the card. It took me FOREVER to tie the bow and get it close to right. My next crafting purchase is going to be a Bow Easy! Thanks for taking a peek... have a wonderful day! The current City Crafters Challenge (CCCB 19) is to make a project incorporating stars. Since my nephew is turning 10 soon, I thought I would make a birthday card for him using stars. I got out my Hero Arts set "Galaxy of Stars", some papers from Fancy Pants (The Daily Grind) and some SU! inks and got to work. I used the current sketch from Taylored Expressions (TESC126) for the layout. The sentiment is from the really cute WPlus9Design Studio set The Birds & The Bees. Today, I'm still on my simplicity kick. This time with color, though. Again, I have two cards for two different color challenges, but both using several colors in common. The first card is for ColourQ (#47), one of my favorite color challenges. I haven't played along the last few weeks for various reasons. The major one being I didn't have any of the new SU! colors. I used the sketch from a challenge blog that I have yet to have a chance to participate in: Pals Paper Arts, PPA57. It was just what I need to finally get my card put together since I was really stumped as to how to use the striking color combo (Poppy Parade, More Mustard, Basic Grey & Bermuda Bay) put forth by Arielle (actually, that happens to me alot!). For this card I used a new SU! set called Just Believe. My second card is also for a color challenge called Color Cue put forth by the very talented Dawn of WPlus9Design Studio. Her colors this month: Gold, Red, Aqua & White/Cream. Now SU! 's Bermuda Bay could be taken for an aqua color, but because it tends more toward the green end, I went with SU! 's Tempting Turquoise because when I think "aqua" I think more of a blue color. 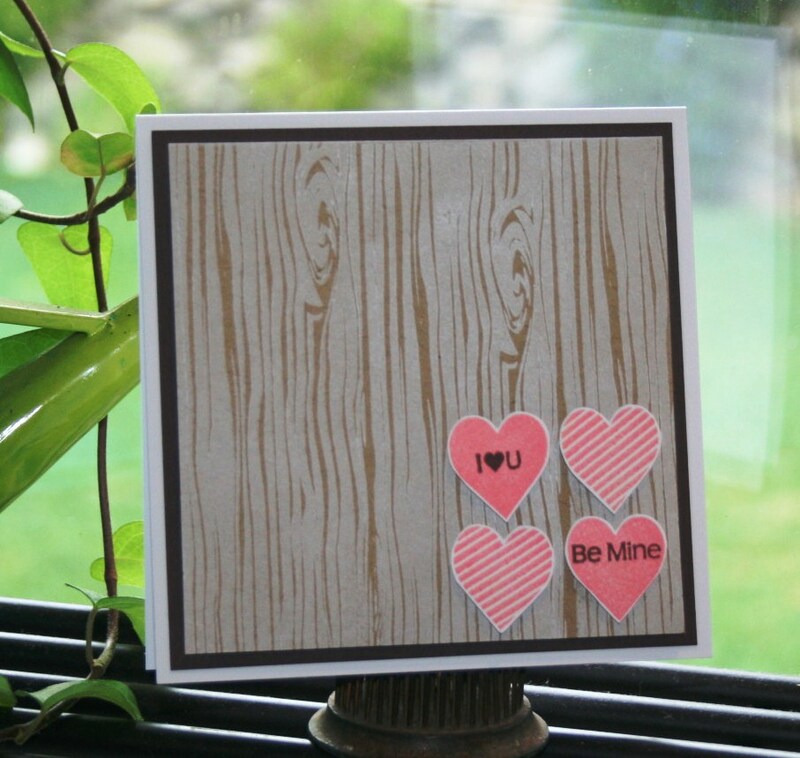 I also used Dawn's fantastic stamp set Woodgrain Silhouettes, one of my most favorite sets, and the current sketch from Clean & Simple, FTL105. I probably should have stamped the leaf image a bit more off the cardstock to give it better balance.... Well, live and learn. So, thanks for taking a peek... I hope you have a wonderful day! During one of my wanderings around the papercrafting world I came across a blog called "Simplicity" and was immediately struck by not only the blog owner, Susan Raihala's, command of the CAS style of papercrafting, but also the absolute elegance of her cards. She also happens to have a great way with words and her posts are fun to read. Susan dispenses tips on creating simple cards with a lot of impact and has a weekly challenge (One Layer Wednesday #17). I finally decided to play along this week, which is kind of funny because she wants us to use border images on our cards. Border images are not something I have alot of and I discovered yesterday that at least three border images I do have at too long to fit on my longest acrylic block! Anywhoo... on to the card. I used this really neat Hero Arts border image that I do own called Large Artsy Circle and a sentiment from the Hero Arts set Thoughtful Messages. I stamped the Large Artsy Circle image on kraft cardstock with black ink, added a few clear rhinestones and then stamped the "thanks" in Close to My Heart Vineyard Berry for a little bit of color. My 2nd card is a little less simple and has nothing to do with the first as I didn't use a border stamp, but it still is pretty simple. After seeing my blogging friend, Heather Maria's, crackled butterflies I had to get my hands on some Ranger Crackle Accents. I had the chance to play around with the Crackle Accents yesterday. My butterflies did get the crackle effect, but unfortunately in the picture it looks like I coated it with Glossy Accents, instead. Again, all the stamps are Hero Arts: Heart Winged Butterfly and Outline Bold Flourish. 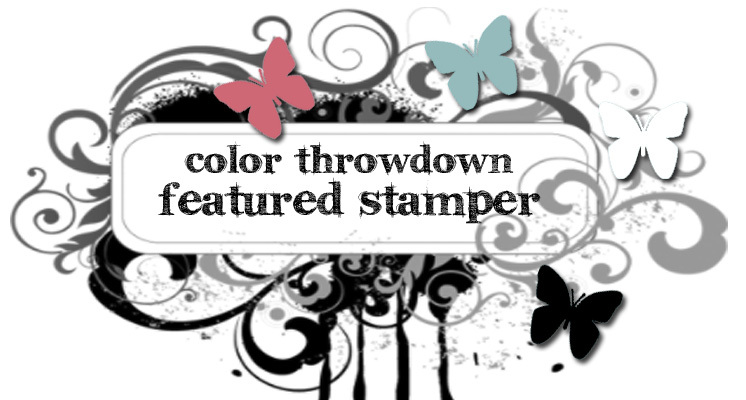 The butterfly was stamped using Stampin Up! More Mustard and the flourish with Close to My Heart's black ink. Rhinestones were added to the flourish, as well. Thanks for taking a peek.... hope you have a wonderful day! Yesterday I couldn't make a card to save my life. My boys were fighting and the creative spirit had left the room. I was trying valiantly to make a card for ODBDSLC 26. The requirement for the challenge was to use a punch (or punches) and/or diecutting. I tried to use the current Splitcoaststampers sketch to help me along, as well as two different ODBD stamp sets. I tried watercoloring, coloring with gamsol, Copics and even crackled glass. Alas, nothing helped... I had nothin'! Finally after a trip to town for cupcakes and flavored popcorn and dinner I was finally able to get something made, something very, very different from what I had wanted to make... but I got it done. Thanks to those of you who stop by for taking a peek. I hope you have a wonderful day. Lately I seem to be using my line drawn images more than usual and today is no exception. I also seem to be making alot of my cards in the clean and simple (CAS) style and again, today is no exception. I think I'm in a rut, but what to do? Just go with it.... 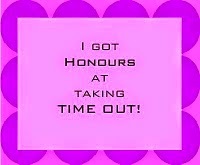 I guess! However, for my next card I'm really going to try to get out of my CAS mode and do something a little less simple. I don't want to be a "one trick pony" ya know??? Today's card is for the current JUGs challenge (#47), a color challenge. The colors are hot pink, lime green & teal. A super fun color combo. 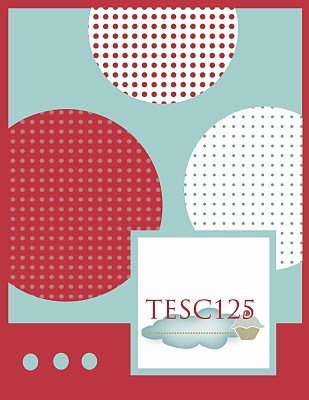 I really like the sketches that Taylor put together each Friday, but seldom get a chance to use one for a card, so I was determined to use this week's sketch, TESC sketch #125. 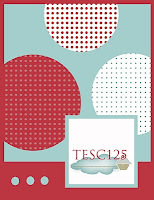 Taylor has put together a fantastic group of ladies for her TESC design team and I always enjoy taking a look at what they come up with. This week I really liked how TESC DT member, Rachel Sztonyk , approached the sketch and so not only is my card a CAS card, it is also to a certain extent a CASEd card! 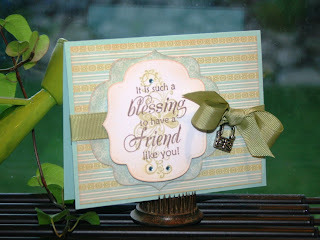 I got out a favorite PTI set, Friends til the End, for the floral images and used some of my Spellbinders dies, as well. All the ink is SU!. 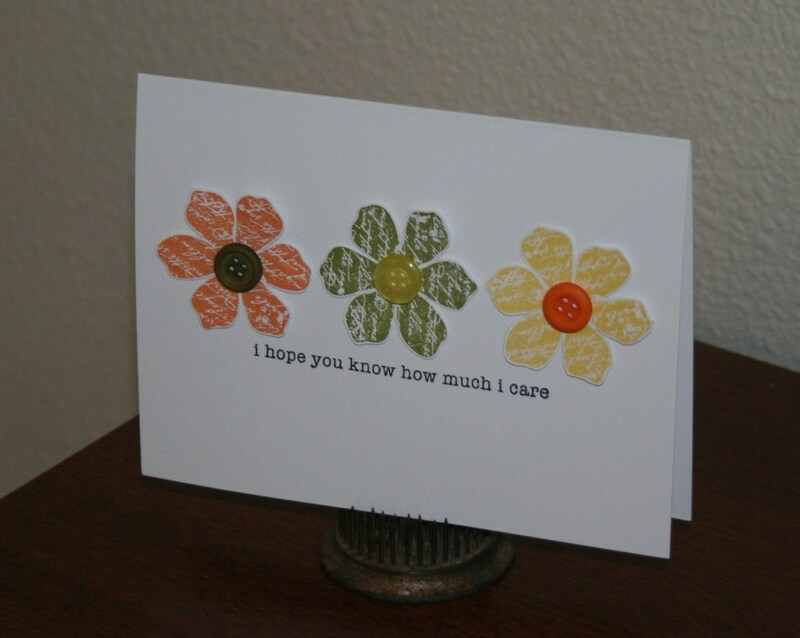 The sentiment is from the Hero Arts set Thoughtful Messages, currently one of my go to sentiments sets. Thanks for taking a peek... hope your day was lovely! As a mom to boys, there isn't much pink or girly in my house. In fact my house is full of cars, airplanes, trains and Legos! So when I saw the new Paper Play challenge to make your project pink I seriously jumped at the chance! For my card I used the Hero Arts Big Flower stamp. I had an idea to use the stamp in a different way, but after doing a coule of test runs with my idea I knew it wouldn't work. The card layout is based on a Clean & Simple sketch. I stamped the flower using SU! Melon Mambo ink and then colored the center with SU! Pretty In Pink ink. The piece was matted with Melon Mambo cardstock and hot pink rhinestones were added to the card to finish it off. The sentiment from the PTI set Year of Flowers Larkspurs was stamped in Pretty in Pink. As I took the magazines out I was excited to see that they had put one of my cards on the cover. This is the 2nd time they have put my card on the cover. But then I started to wonder "why do I have more than one copy"? Well that became apparent when I started looking through the magazine. They had published an article that I had sent to them!! This is my first time having an article published and I must say it feels pretty cool! Thanks for stopping by... I hope you get some happy mail, soon! 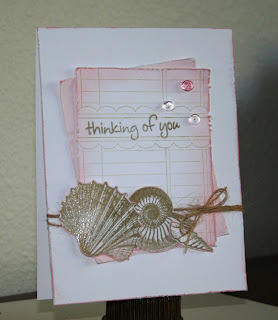 Here's a card I made last night for Repeat Impressions What If Wednesday (A1110) sketch challenge. 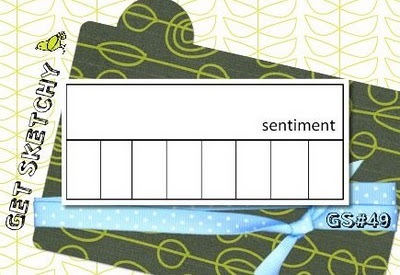 I was so fortunate at the end of July to be the winner of a $25.00 gift certificate to Repeat Impressions and I was able to get some of their lovely stamps. If you get a chance, please go check them out... they have lots of great stamps and right now are sneak peeking some of their new Christmas stamps. I used some more Cosmo Cricket DeLovely paper for the card. This happend primarily because I was sorting through a pile of cardstock sheets and scraps, trying to use a few of them up! The stamps are from the SU! set Just Believe. 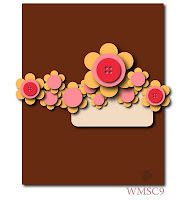 I'am also going to put this card into Scrappy Saturday challenge #18 at weeMemoris because I used these really cool flower brads from SU! on the card. Thanks for taking a peek... have a lovely day! The new challenge at City Crafters Challenge (CCCB18) blog is to make a card featuring a lovely lady (and/or girl) on your card. At first I was going to using my Singing Cowgirl card, but then remembered that I had this sweet little Crafty Secrets image cut out that I had been wanting to use for the longest time. The image is of a little girl holding a basket of roses. First I had to dig her out of wherever she was hiding and then get to work. After some serious searching I finally found her in a drawer with some of my stamps! I used this week's Mojo Monday sketch for the layout and some more of those older My Minds Eye papers I have. 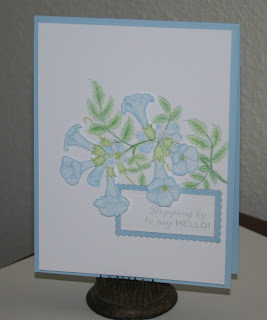 I went all lavendar and green with the card using the retired Stampin Up! color Lavendar Lace and PTI's Spring Moss. There is absolutely no stamping on this card. The only ink used was for a light distressing of some of the cardstock. I finished off the image with a bit of glitter that I applied using my Quickie Glue pen. Thanks for taking a peek.... hope you are having a wonderful day! Now, I don't own alot of cowgirl/cowboy stamps... In fact I own exactly one. 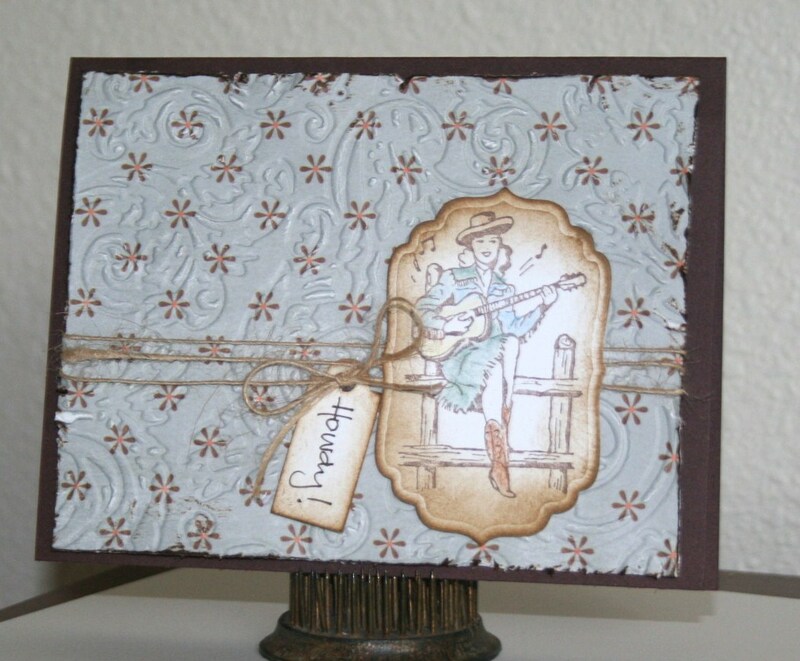 This lovely Singing Cowgirl stamp from Stamp Francisco. When I saw her I immediately knew that I had to have her as she reminded me of someone who has become very dear to me... my blogging friend Elise of Mamacow Creations fame. If you have not yet been to Elise's blog you need to get yourself there right away. As well as being a fantastically talented crafter, Elise has an amazing story telling ability, ie... her blog posts are hilarious! So, Elise... this card is for you. I got out some old My Minds Eye papers that I have, as well as a brand spankin' new T!m Holtz Fades embossing folder called Regal Flourish. The paper was embossed and distressed with ink and a distressing too, then wrapped with the twine. I stamped the image with Memento Rich Cocoa ink and then colored my Singing Cowgirl with my Prisma pencils and the blending pencil. Some distressing was done with Ranger's Brushed Corduroy Distress ink. The card layout is based on the current CPS layout and I made it for the current JUGs challenge. Thanks for taking a peek... hope your day is wonderful... YEE HAW! My card for ODBDSLC25. The challenge this time is to stamp your image more than once. 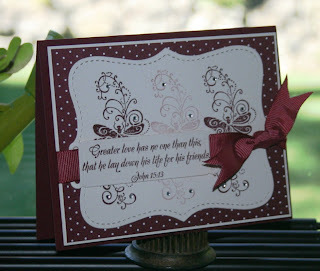 I stamped the swirly dragonfly image from ODBD's Friendship set in Bravo Burgundy on Vintage Cream cardstock. The middle image was 2nd generation stamped because I was going to overstamp the verse, but it didn't look right on the test image, so I stamped the verse on Vintage Cream and diecut it with a Spellbinders ribbon tag die. 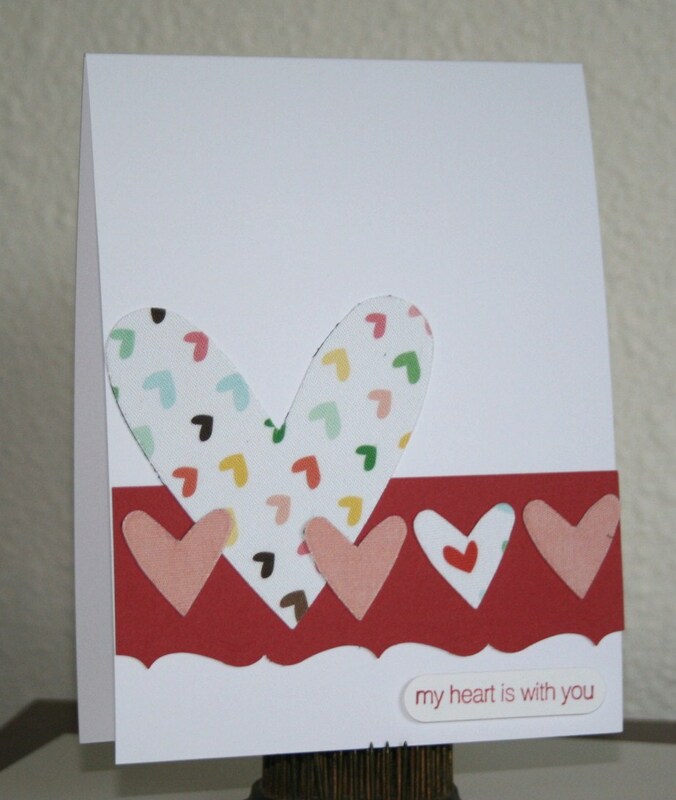 This card is for the current City Crafters challenge "I Left My Heart in San Francisco" to use hearts. I recently bought some American Crafts adhesive backed fabric paper and pulled it out for my card. I kept things super, super simple. The fabric paper is pretty cool, but I'm not really sure that I will invest any more money in it. Moxie Fab Tuesday Trigger - She Sells Sea Shells..
Another Hero Arts card today... this one for the current Moxie Fab Tuesday Trigger challenge. Initially I thought the challenge ended last Monday, the 9th, and was pretty bummed as I really wanted to give this trigger a go. So I was pretty happy when I saw that the challenge ran through the 16th. 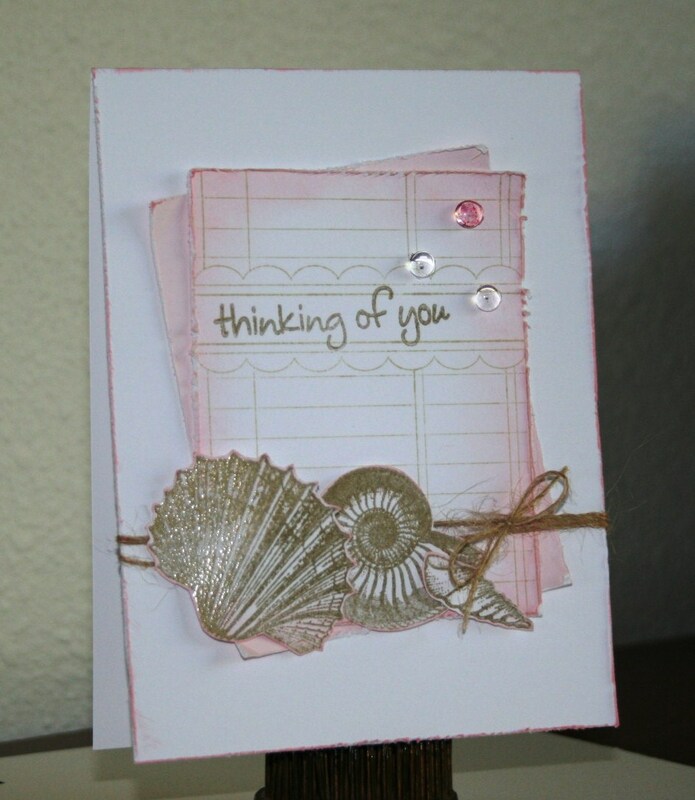 The shells were stamped in Encore gold ink and then embossed with clear embossing powder. I really like how they turned out, as sometimes gold ink and/or embossing can look... well just a little too gold. 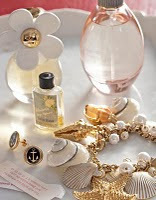 The pale pink was brought in to represent the pale pinkish color of the bottle. 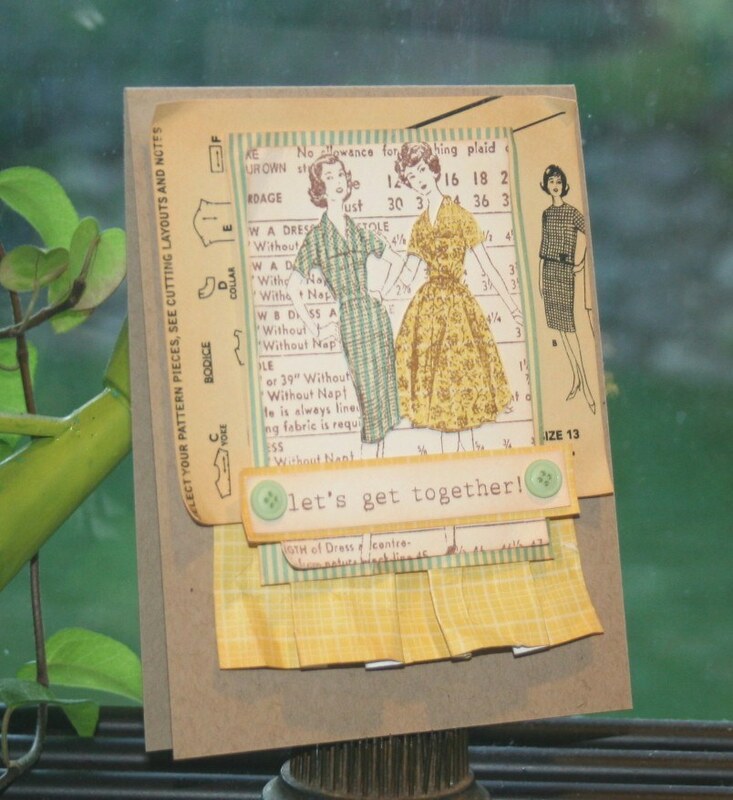 I made this card for the current Hero Arts challenge using Mojo Monday sketch #151 and the super fun Thrift Shop papers from October Afternoon. Thanks for taking a peek... hope you have a wonderful day! Really squeaking in with this card today. 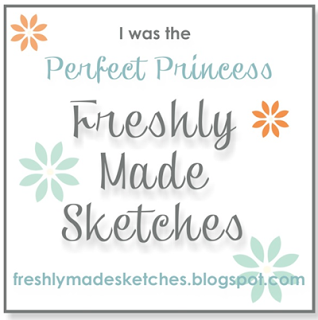 I love Waltzingmouse Stamps and the new Waltzingmouse sketch challenge blog, but I so far I have only been able to participate in two of the sketch challenges. Today I decided to make it three. I used my new Flourishes set Humming Along for the card. Stamping the image with Memento London Fog ink and then coloring it with my Prisma pencils and gamsol. I kept the card really simple because I wanted the image to shine. The sentiment is from the Humming Along set, as well. 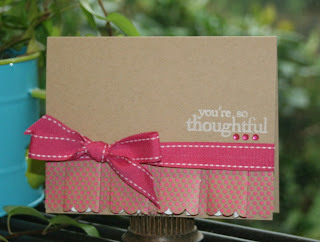 The card is also for the brand spankin' new Flourishes challenge called Bringing Back Beautiful (BBB01). For the very first challenge we are asked to use our favorite coloring technique. It is safe to say that I really enjoy coloring with Prisma pencils and gamsol. I'm trying to work on my Copic coloring so I can add that to the list. The cardstock is PTI's white and Spring Rain. 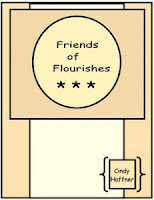 My card today is for ODBD's Shining the Light challenge and the current Flourishes challenge. The requirements for ODBD's challenge were to use three of something. I ended up using three designer papers and three different stamps. 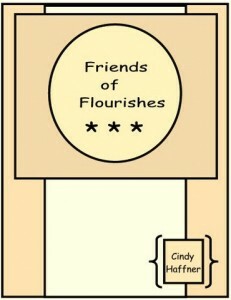 The Flourishes challenge this week is a sketch challenge which was most helpful. I must acknowledge in my post that the lovely ladies over at ODBD's Shining the Light challenge have been so very sweet to me and picked my card TWO WEEKS in a row for the Shining the Light award! Thanks, ladies! You don't know how much that meant to me! 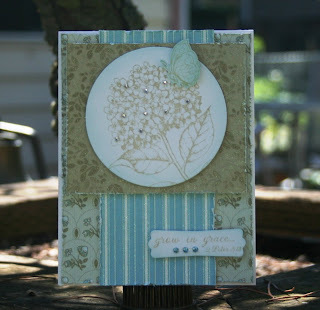 For my card I used the following stamps: Hero Arts Hydrangea (love it!! ); Flourishes Gerbera Daisies (butterfly) and ODBD's Grow in Grace (verse). The designer papers are from the DCWV mat stack Linen Closet. Ink is courtesy of Close to My Heart (Bamboo) and Hero Arts (Soft Pool). I did a bit of distressing of the edges just to soften things up. I took the picture outside since today was a nice sunny day. I think it turned out pretty nice.... it isn't so washed out as the indoor shots. Thanks for taking a peek... have a blessed day! 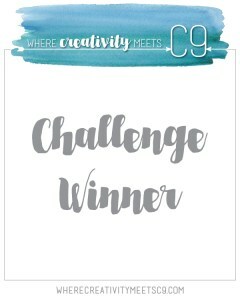 The EtsyInspired challenge blog is celebrating it's 100th challenge this week and they have some really super cool prizes to give away. The Etsy shop that we were to get our inspiration from is Cathy Walter's shop. Her shop is full of neat little pendants. 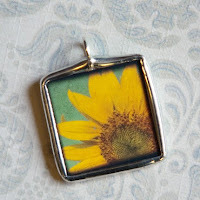 For my inspiration I chose this little pendant. For further inspiration I turned to the current Paper Play challenge recipe of three flowers, two designer papers, one ribbon and one charm. I have been trying to make a card using all those items for the last week. 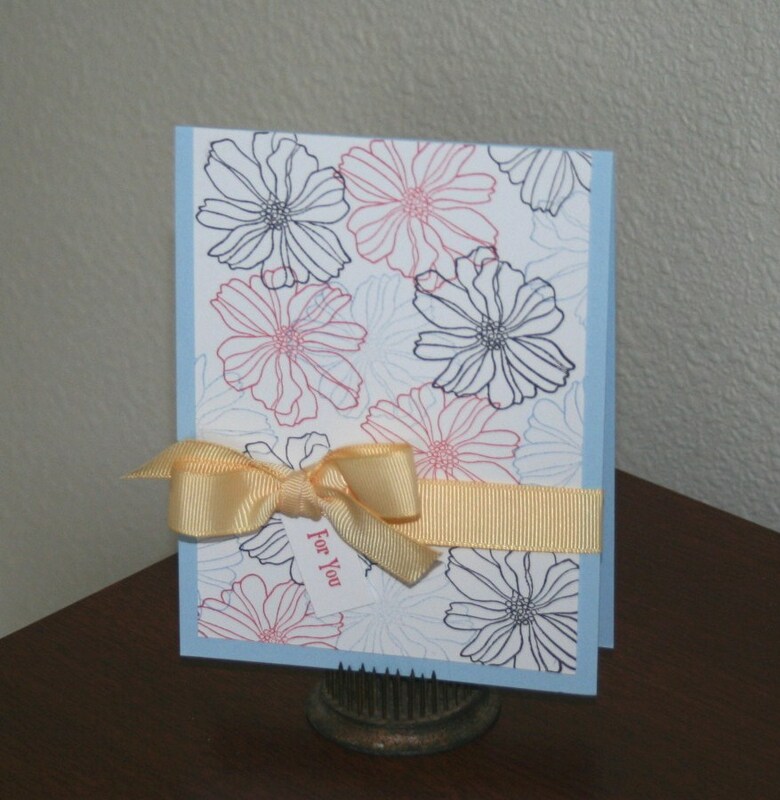 The first card had the three flowers, charm & ribbon, but no designer paper. 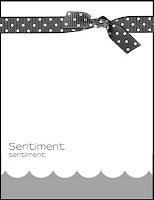 The 2nd card had the designer paper, ribbon and charm, but no flowers! Finally I got it right! I used BasicGrey Origins papers for my card, which is kinda funny because I did my first EtsyInspired challenge last week and used the Origins papers for that card, too. But they are pretty sweets papers and so fun to use. 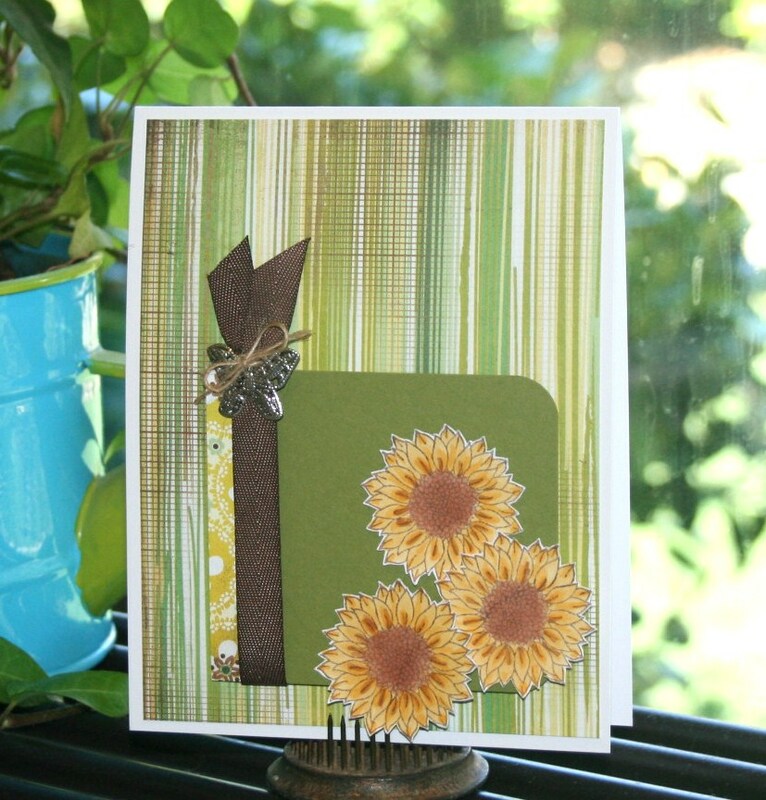 The sunflower image is from a new to me stamp company called Repeat Impressions. On July 28th, the same day I won "Win a Day" from Hero Arts, I won a $25.00 gift certificate from Repeat Impressions! How cool is that???!!! I stamped the flower three times and colored it with my Copic markers. 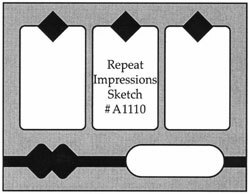 The card layout is loosely based on a sketch from Clean & Simple. Thanks for taking a peek.... enjoy your day and check out the 100th EtsyInspired challenge... you could win a fabulous prize! 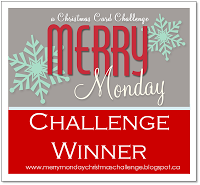 Two cards today.... one for ColourQ and one for Color Throwdown. I think this is the first time I have done a post where I have two cards for two different challenges... not something I will be doing often. I almost didn't make a card for ColourQ as I don't have the new SU! color Poppy Parade, but then I looked at Ruby Red which seems to be awefully close and decided to move forward. 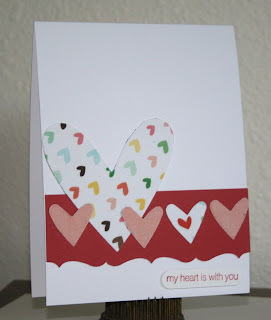 Created by background using one of the line drawn stamps from the SU! Fifth Avenue Floral set, using black, Ruby Red and Capri Blue from Fresh Ink. 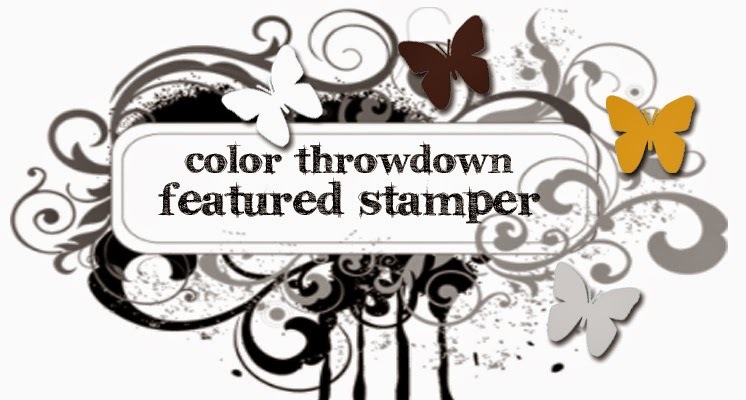 The 2nd card is for Color Throwdown which I almost didn't do either, until I saw the current sketch from Clean & Simple. I really like the bright colors that were picked for this week's Color Throwdown. I used another SU! 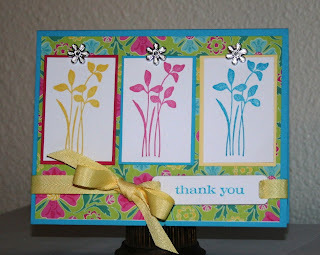 set Vintage Vogue.... stamping the large flower in each color, cutting them out and adhering to the card front. The sentiment is from Hero Arts - Thinking of You.. Thanks for taking a peek.... enjoy your day! I really enjoy taking part in certain challenges like the ones at Our Daily Bread Designs because it gives me the opportunity to make cards that are a little more elegant. I have been participating in ODBD's Shining the Light challenge and have added their Stamping in Time On Assignment (SNTODBD15) challenge to my growing list. This week's challenge was to use a "go to" sketch for your card. 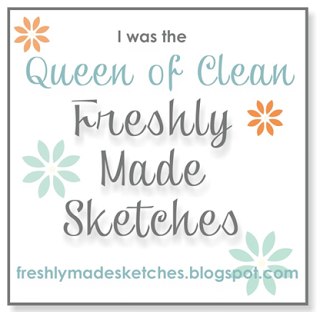 I don't have a particular sketch that I return to over and over again, but I do have a sketch blog that I return to over and over again: Clean & Simple. Lately I have used one Clean & Simple sketch (which I have posted) for several cards and I'm using it again for this card. The stamps I used are from the ODBD set Grow in Grace, which I just love. The dogwood image is gorgeous and the sentiments/verses are beautiful. I punched the bottom edge of the cream cardstock piece and then stamped the dogwood image on the cream cardstock with River Rock and then on a scrap of cream in Pretty in Pink. The three flowers were trimmed out and popped up on the main image. I slightly overstamped the verse over the main image as well. I added a few little rhinestones and some yummy cream organdy ribbon to finish it off. A little card I put together using the current colors put forth by the very talented Dawn of WPlus9Design fame, Color Cue #6. She always picks some of the loveliest color combos for her challenges. If you haven't checked out Dawn's stamp sets yet, you really need to get yourself over to the WPlus9Design Studio website and take a look. Dawn is releasing four new stamp sets this weekend. Her projects are out of this world! I am always surprised at the number of challenges that I come across as I wander around the papercrafting world on the internet. Everyday it seems a new one is popping up. A new to me challenge blog that I came across recently is the EstyInspired challenge blog. I found it to be very intriguing and thought I would give it a try. The Etsy shop that we are to seek our inspiration from is Becky Kazana's shop... full of all kinds of whimsical cake toppers, banners and cards. 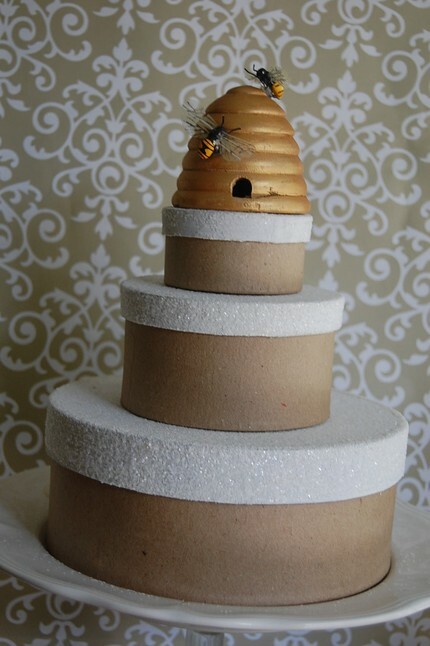 For my inspiration I chose her cute little bee hive cake topper. Of course when I saw the bee hive topper I immediately thought of the completely cute Hero Arts set Be Happy. 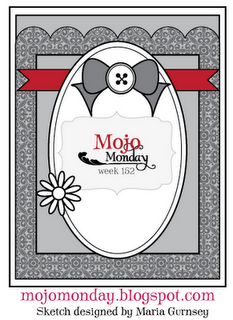 And to provide some furtehr inspiration I decided to use the current Mojo Monday sketch. Add some PTI cardstock, BasicGrey Origins pp, a few punches and I was done. The Etsy Inspired challenge blog will be celebrating their 100th challenge on August 7th and have a some lovely prizes... If you haven't given them a try yet, this might be a good time to do so. I know I will be. Thanks for taking a peek... have a lovely day. 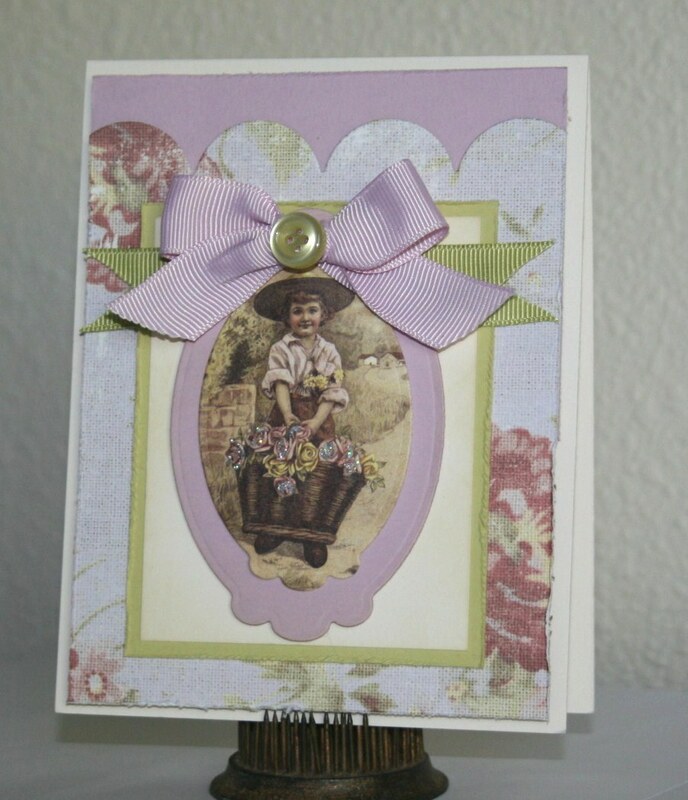 The current ODBD Shining the Light challenge is to use ribbon, a charm and one other embellishment on your card, but that embellishment cannot be a flower. Easy enough since I don't often use flowers on my card, but the charm part was going to be hard since I don't have a lot of charms. In fact, I had exactly two charms both purses, that I got with a scrapbook kit I bought several years ago. Because the charms were purses, I made my card a girlfriend/friendship card using ODBD's set "Friendship". I love the swirly dragonfly image, as well as all the sentiments/verses in the set. In an effort to use up some of my older supplies I pulled out PTI's 6x6 pad of Everyday Blessings pp and used the coordinating PTI cardstock of Aqua Mist and PTI ribbon of Spring Moss for the card. Added a bit of distressing using CTMH's Parchment ink to tone things down a bit. I have always found the sketches from Get Sketchy to be very creative and intriguing, but I rarely get a chance to make a card for their challenges...not sure why other than I have too many other things going on. 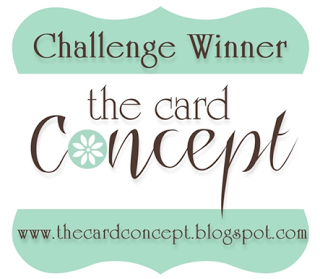 The sketch this week is no exception and when I saw it I was determined to make a card for the challenge. When I saw the CAS challenge at Splitcoaststampers to use polka dots my idea started to take shape. So, I got up this morning, pulled out my PTI Dotti Biscotti pad, picked out the Raspberry Fizz dots and got to work. I used this fun little pleating detail that Nichole shared on her blog during a PTI release last year. It is super simple, but packs a punch. For my card I added the extra detail of punching one edge with my SU! Scalloped Edge punch. Finished it off with some PTI's Raspberry Fizz double stitched ribbon, CTMH's White Daisy ink and some Kaiser pink rhinestones. The sentiment is from Hero Arts - Thoughtful Messages.